Never been; looks like a good monochrome subject though. RuneE: We are supposed to get up to 40º F today and we should get some rain with that and hopefully it will wash away the snow that is still here. You sure made a great black and white shot out of this one. Or maybe you just shot it in black and white? Great B&W shot for the day, Rune! My whole world here in Oregon is GRAY and has been for some time!! Looking forward to some color and sping!! Yes, I know, I do have a long wait ahead!! Have wonderful weekend!! Nice contrast in the textures between the old block and 'newer' bricks. I love how you caught a reflection in the bricks on the right side of the picture. I like this picture very much! I especially love the bow-window. I could easily imagine this pic as a cover of a good book! I love the contrasting shapes and light, and the reflection. Artig.... først ser jeg det flotte lyset, de ulike teksturene og overflatene, og formkontrastene... og da jeg tror jeg er ferdig oppdager jeg plutselig et liiite menneske der nede med tunge bæreposer! Nydelig lys og variasjon i teksturene. Against all that stone and shiny non-organic stuff, in light and dark, a single tiny human. Somebody needs to care about her, so I will. I like this angled shot. Well lit. Beautiful photo in B&W! I like the reflections and the perspective! 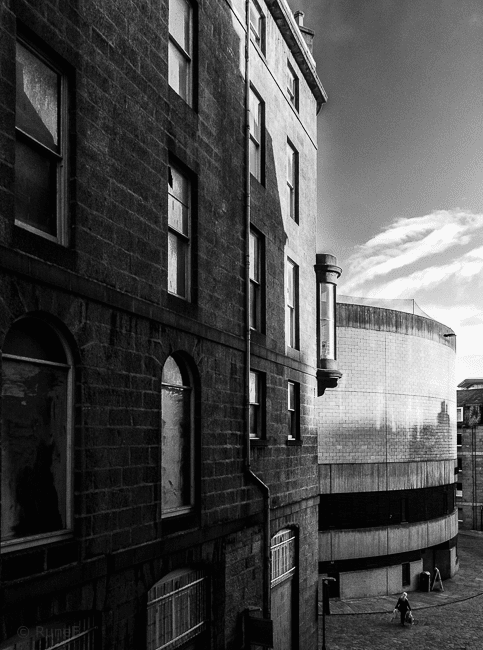 I like the lonely person in-between the building..adds dynamic to a perfect b/w picture. Thanks for sharing. Solitary shopper - nice capture. Wonderful contrasts, between the architectural forms, textures, shadow and light! You shot this from such an interesting angle. It tool me a while to figure out what I was looking at. Nice range of colour from white to black, and I like the contrast of the straight and curved lines. The tones of light create a wonderful mix of shadows and reflections. Clean and sharp cityscape shot! Vackert ljus på en vacker byggnad! The B&W let the architecture speak for itself, the contrast of the buildings is interesting. BTW I followed the link to the blog dedicated to B&W photography and bookmarked it, there are so many interesting captures. Beautiful inspiration. Oh I love the north of Scotland. Never got to Aberdeen though. Nice B & W shot. Råbra bilde, og er helt toppers i sort/hvitt. Mange spennende detaljer som fargene lett kan overskygge. Ha ei fin ny uke, Rune! Great shot! I love the contrast of the light, round building and the darker, angular one. Perfect in b&w. Flott fanget - kontrasten mellom lys og skygge. Og så vakkert "fremkalt". Måtte du få et fantastisk 2014, Rune! Wow! This is really lovely!